Several year ago I was leaving for work in the morning and noticed I had left my Christmas lights on all night. It was still dark out when I left for work, so there was no missing the lights. I stopped my car and turned off the lights right away. We only had a medium size tree wrapped in lights, so I don’t think it used enough energy to make a noticeable difference in our utility bill. But one thing I did notice was that several other houses on our block still had their lights on. When I thought about it, I realized those same lights were on every morning for the previous weeks. Almost every house had a larger light display than we did. So I am sure they had a noticeable change in their electric bill the following month! That got me thinking… Why do people leave the lights on throughout the night? It doesn’t make sense to me to leave them on after a certain point because almost everyone is asleep and there will not be anyone around to enjoy them. I think leaving the lights on all night needlessly uses a large amount of electricity and costs people a lot of money. I don’t think the electric companies mind, but is it the responsible thing to do? I have since placed our lights on an automated timer to prevent this mistake from happening again. But I still see dozens of homes in our neighborhood that are lit up throughout the night. I’m sure it costs them quite a bit of money. They can save quite a bit by using an outdoor outlet timer with photocell light sensor. They only cost a few dollars and will automatically turn your lights on and off (more about this later in this article). We have since moved to a new home, and we now have a (slightly) larger Christmas light display. It’s not huge, but it works for our yard. We have also made several changes to make our display more energy efficient. In fact, we don’t experience a noticeable change in our electric bill during the Christmas season, even with our indoor and outdoor Christmas light displays. Perhaps the biggest way to save money is by using more energy efficient lighting. LED lights use a fraction of the energy used by incandescent lights, and in general, they have a longer lifespan. You may pay a little more for them up front, but the longer lifespan and reduced energy requirements mean they will generally pay for themselves within a year or two. LED lights also produce less heat, which is better when they are used indoors. Another benefit of using LED lighting is the ability to daisy chain more strings of lights together, since they generally draw less power than traditional incandescent lights. Be sure to check the manufacturer’s recommendations to determine how many strings you can place on each outlet and in each chain. We don’t have many lights in our display, so we can do our entire display from one outlet. We use only LED lights in our Christmas light displays, including our outdoor display, our pre-lit Christmas tree, and other seasonal lighting. We have also swapped out many of our interior lights with LEDs, though we still have some CFL lights, which are still more efficient than the incandescent lights. You should save quite a bit of money each year by switching to more energy efficient lighting. The next big change we made was installing an outdoor outlet with a built-in photo sensor and timer on our outdoor electric outlets. This turns on our Christmas lights on at dusk, then turn them off after 6 hours. This is nice because we never have to worry about remembering when to turn our lights on or off. The timer can be set for 4, 6, 8, or 12 hours, or you can set the sensor to automatically turn the lights on at dusk, and off at dawn. We opted to set the timer for 6 hours, which is usually a little after we go to bed. It gets dark around 4:30 in December where we live, so that keeps the lights on until around 10:30pm. There is very little street traffic in our neighborhood at that time, so that’s a great time to turn off the lights. The convenience and cost savings of this device far outweighs the cost, which was very reasonable, at less than $10. I bought ours as part of a package, with outdoor extension cords and other seasonal items. You can often find these on clearance after the holidays, but I would just opt to buy one now, so you can enjoy the convenience and energy savings throughout the season. 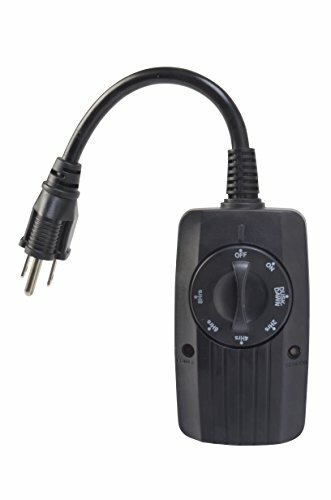 Here is a comparable item at Amazon: Outdoor Outlet Timer with Photocell Light Sensor, Weatherproof. Outdoor Outlet Timer with Photocell Light Sensor Price: $12.54 Automatically turn holiday lights on and off. Adjust the outlet timer to your preferences (dusk-dawn, 2, 4, 6 or 8 hours). Note: Be sure to buy extension cords and outlets designed for outdoor use, as using one designed for indoor use may cause serious problems if it gets wet! What About Interior Lighting Displays? The easiest way to control exterior Christmas light displays is with the photosensitive automatic timers mentioned above. But these aren’t a great solution for indoors, since they turn on when the sun goes down. That said, it’s a good idea to turn off your lights when no one is there to enjoy them. We leave our lights off during the day, and turn them on when everyone comes home from work or school. Then we simply turn our interior lights off before going to bed. But if you want to get fancy, you can use an automatic timer for your interior displays. They are slightly more expensive that the exterior timers, but still very affordable. If you really want to get fancy, you can get a smart outlet that you can control with your smartphone and a wi-fi setup. Many of them can even be controlled with Amazon Alexa, Google Home, your smartphone, or a wi-fi setup. They can be purchased for less than $20. This is an affordable way to save money, and also turn lights on and off if you are away from home. 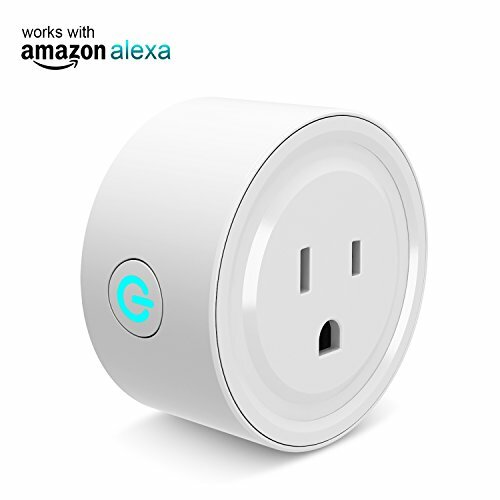 Smart Plug Outlet Works with Wi-Fi, Amazon Alexa, Google Home, Smartphone Price: $9.99 Control your outlet with Amazon Alex, Google Home, IFFT, and your smartphone. You can usually save a lot of money if you buy your lights closer to Christmas, or after the holiday. The only downside is trying to time everything, as the best deals are usually limited to product on hand. There can be slim pickings if you wait too long in the season. So buy when you find the right product at a price you can live with – otherwise you might just miss out! Where to find the best deals on Christmas lights: Unfortunately, I don’t have a great recommendation, since this varies from year to year (I would check places like Ebates, Slick Deals, and similar websites for deal information). You should check the big box stores like Home Depot, Lowe’s, Wal-Mart, Target, Meijer, Menard’s, and similar locations. But you can also find them in unlikely places, such as grocery stores, department stores, etc. Do you leave your Christmas lights on at night? If so, why? I unplug mine just before bed, usually sometime around 11:00PM. Though we only have our tree and some up around the inside of the window rather than outside. If they were outside I may just leave them on unless they were on a timer. By the time I remembered they were on I would probably be wandering outside in the frozen wasteland of Canada in a housecoat trying to unplug something. We actually have a remote control power plug for outside devices that I (have yet to mount, being lazy) will be using to turn on the block heater in the car in the morning. We will do something similar for lights when we have a bigger display (we get more and more each year, this is the first in our new home). nope, turn ours off when we go to bed. Waste of electricity, plus I am afraid to death something will short and the house will catch on fire. I think some people do it because they see their light display as a kind of public art. They want people who drive by to enjoy it. We only ever had candles in the window on a timer that had them go off @10pm. I think they came on @ 5:30pm. A neighbor of ours has a huge display with a blowup lighted train with a merry-go-round inside of it. They leave them on 24/7. I can’t even imagine what their electiric bill looks like! Last year we had ours on a timer. I think they came on at 5:30 and went off around 11. Using a timer is a great idea. We just have a small display, and we do it manually. I guess for a few bucks, a timer would be a worthwhile investment – especially for a large display. Mrs. Micah, I understand the public art, but there are very few people driving by at 2am; especially in the secluded cul-de-sac that I live on. We just have one of the “old-fashioned” non-electrified ornaments on the door. We don’t put christmas lights outside, as we live in the country, but we do turn the trees (we have two, it’s a big house, and a tradition we have, i’ll explain more if someone asks) off when we go to bed, not really having them on all the time anyways. Our light bill comes from outside lighting we have year-round. The lights are on timers though to go off about the time we would all be in bed, and turn on about the time it gets dark, we adjust as the season changes. With christmas lights though, the electric company here runs a contest, whoever has the best display gets the entire month of december (maybe Jan. too, not sure) for free. Problem is the same person wins it every year, but some of the other houses look nice just the same. My neighbor put their lights up about a week ago and they’ve left the outside lights on 24/7 since they put them up. I too think it is a waste of electricity. I too use a timer. The come on around 5p and go off at about 10:30p. I had to go to multiple timers this year, since I overheated the one I used in the past. With multiple timers they never go on or off at exactly the same time but are within 5 minutes. Glblguy – yeah, I don’t like the idea of lights shorting out, especially in wet weather (if the plugs get covered in snow or ice). Single Guy, unless someone lives in the far north, I don’t understand why they would leave them on 24 hours a day. That seems like a HUGE waste of resources and money! Especially when a $10 timer can fix that problem! D4L, Good idea to even out the load. Pulling too many amps through an outlet can be a fire hazard. We used to have two trees too – upstairs for the family and a little tree downstairs (costs about $15 for a real one) for excess ornaments and a place to put gifts that would be going out of the house. I remember having one little lighted thing in my window that we would leave on all night, couldn’t have used much electricity (only a dozen little bulbs) and made the nights Christmas-y, but outer lights and the tree were off at night. We used to leave small electric candles on in the windows all night, but those don’t pull many amps or use a lot of electricity. What I just don’t understand is why some people leave everything on all night – outer lighting display, regular tree, and any other decorations? Excessive Christmas lighting is definitely a symbol of the overly materialistic season. I can’t bring myself to view garish displays of electricity as “art.” I prefer the more subtle displays, and of course, use a timer. I agree, Flexo. Our house has one tree with simple white lights, which is what I prefer. We always turn off all of our lights when we go to bed, except for Christmas Eve. Christmas Eve the lights stay on all night and are lit when we wake up Christmas morning. I guess it’s so Santa can find our house? I just unplug my Christmas lights before going to bed; I don’t have a timer. But they only cost a few dollars at Wal-Mart, Home Depot, or a similar store. The directions should be fairly easy to follow. I came across this website after doing a search because we have a neighbor that leaves her on all night. She has a large display and it shines into my room. I cannot for the life of me understand why anyone would do that, especially during times like these when money is tighter and we all are trying to be “greener”, waste less, and consume energy. Personally I think it’s very idiotic to do because of the risk of fire. I guess they just must really be infatuated with them. E.A., I never understood why people leave their lights on all night, either. I think it’s great that people want to get into the spirit of the season, but I don’t understand they need or desire to waste money by leaving lights on when no one will be awake to enjoy them. I unplug our christmas lights every night. My husband thinks I should leave them on all night….We got into a debate. He thinks the majority of people leave them on. I think the majority turn them off at bed time. We made a bet to see who was right (our common practice when we can’t agree). The results seem to be 50/50. I turn my Christmas light on when it gets dark and I keep them on ALL NIGHT until I wake up the next morning and only then do I turn them off. You may ask why I keep the lights on all night long? Well, its because of the Christmas spirit. You never know who will be driving down your street or who will be walking down your street or who will be outside late at night. When people see Christmas lights they get reminded of what Christmas is all about and that is caring for one another and joy. I don’t leave them on during the day when the sun is out, but only at night and plus this only happens for 1 month out of the whole year so I think that it is worth it. You also have to consider that some people have jobs where they get home late at night after other people have turned off their lights already. Someone has to keep their lights on so that these people also get to see Christmas lights too. You have some people who work night jobs so wake up and go to work at 3:00 am. What about these people? This is why I leave them on all night long so that these special groups of people don’t feel left out. If you are worried about wasting resources then don’t. There are many other things which waste resources far more than some extra lights which are only displayed for one month in an entire year. No matter what time it is in December there will always be someone driving on the road at night and so that is the reason why I leave my lights on ALL NIGHT long. I leave my lights on for them. Me too for the exact reasons you describe! Christmas only happens one time a year. It’s absoluteky magical and I want to enjoy every ounce of the magic and pass it on. Merry Christmas! ? I wake up at 1:30 am to deliver newspapers everyday, therefore I am usually going to bed at dusk and don’t get to see Christmas lights unless they are left on all night long. So thank you to everyone who does leave them on overnight. I have lights all over the front of my house and yard and I also use timers. Mine come on from 5-8am and then 4pm-12am. Agreed. No reason to leave them on all night UNLESS you want to support the power company. What a drain on your bills and the environment … just get a timer folks. Best investment ever. Aside from costing a ton of money over the course of the Christmas season, the carbon emissions it produces are putting our world at risk. Timers are a must, as are LED lights … great post! I agree with everyone on the timers. Definitely the best way to save money. The timers work amazingly. Another option to lights that I love are the Star Shower Motion lights that are on T.V. My friend has one and I think I’m going to get one for next year. They make awesome “smart outlet covers” that you can control with an echo device and probably other devices. That makes it really easy to control your lights and other electronics if you’ve already gotten into bed or have left the house and forgot to turn them off. I think its a great idea to use with other electronics in case you’ve left for work and aren’t sure if you’ve turned them off. I turn my lights on when it starts getting dark and leave them on all night. I turn them off at 7:20 when I get up in the morning. I second the previous comment because it is all about Christmas spirit. Christmas lighting should be enjoyed, my family and I do drive around to view all the houses with decorations.